The Royal Navy built 7 Trafalgar Class submarines between 1978 and 1990. Although similar in looks to its predecessor, the Swiftsure Class, the Trafalgar Class is both faster and quieter. These nuclear submarines have 5 tubes capable of firing both spearfish and tigerfish torpedoes and RN submarine harpoon missiles. Both HMS Trafalgar and HMS Triumph are also capable of launching Tomahawk missiles (the others should be given this facility by 2006). Originally intended for Cold War operations these hunter killers are designed to attack enemy ships and submarines. Indeed those with Tomahawk facilities are also capable of mounting a land attack. However, armed also with cameras and thermal imaging periscopes, they are equally capable of surveillance activities. 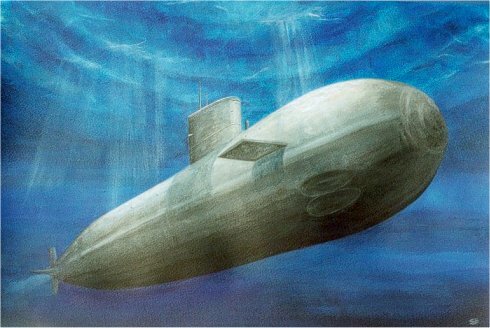 Despite some serious technical problems in recent years, all 7 Trafalgar Class submarines are still in commission today (2002). The "Buy Now" button will take you to SubArt's secure PayPal page where you can purchase this artwork in your own currency (no PayPal account required).